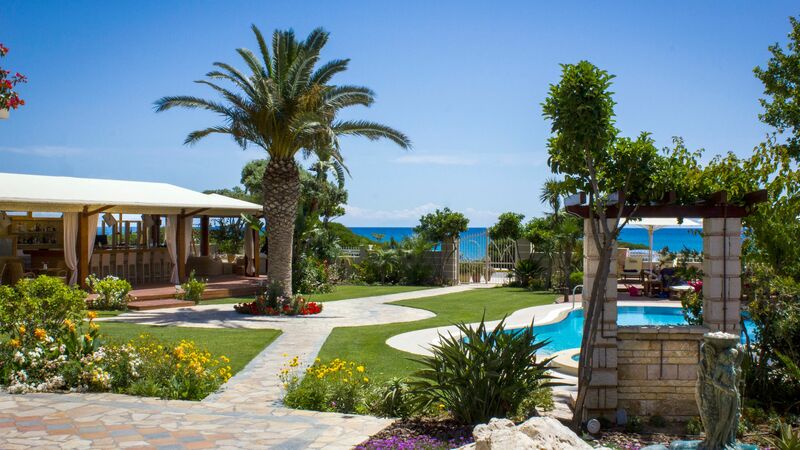 Skala holidays take you to the south east coast of the Greek island of Kefalonia. It’s full of traditional Greek restaurants, elegant bars and a huge stretch of golden sands lapped by crystal clear waters. Surrounding the town you’ll find green hillsides full of forests, ideal for mountain biking, walking and hiking, as well as Roman ruins which are dotted throughout the surroundings. The town of Skala itself is home to tavernas, cafés and bars, with the old part of the town ideal for those wanting to soak up the culture of the area. It’s a former fishing village with whitewashed buildings and some newer areas where you can enjoy the best of both worlds. Couples will love the upmarket restaurants and hotels, while families will find plenty of activities for children, including playgrounds, water sports and lots more. Plus, the Blue Flag beach has clean sands and a selection of restaurants. Luxury holidays in Skala bring you wonderful modern amenities combined with pretty buildings dating back to the town’s history as a former fishing village. There are Roman ruins which date back to the 7th Century BC, stunning countryside surroundings and pretty golden sands where you can spend days simply relaxing. Upmarket hotels are dotted throughout the town, while boat trips will take you to stunning bays and show you the best spots dotted throughout the rugged coastline. When it comes to finding the right luxury holidays in Skala, book with Sovereign and you can relax, knowing you’ve found the ideal property for your trip. We’ve perfected the art of holidaymaking, with expert Trusted Advisers on hand to get to know you before recommending one of our carefully selected hotels. Stay at Villa Costa and enjoy its beautiful gardens, elegant terraces and beautiful architecture. Flight time from the UK to Kefalonia is around 3 hours. Transfer time from Kefalonia airport to Skala is approximately 40 minutes. Like the rest of the Greek islands, Kefalonia promises near-perfect beach weather. July and August are when the mercury reaches its peak, with temperatures often reaching the low 30s. For something a little cooler, you can still enjoy plenty of sunshine and temperatures in the early to mid-20s in May and October.